Along with Steins;Gate, Gosick, Ano Hana, and Madoka Magica, Mawaru Penguindrum was one of the most buzzed about anime in 2011. With the overflow of symbolism and eye raising plot twists, following the storyline may have been difficult at times. However by the end of it, the exacerbation of symbolism will tie all the plot twists together but the symbolism leaves countless discussions for people to talk about. A plethora of symbols reoccurs during the course of this anime; the two main ones that reoccur are penguins and apples. I took the liberty of looking up the symbolism behind these two subjects. The symbolism behind penguins serve as: indomitable sprits, taking on the challenge of living in extreme conditions that most others could not survive. Where as apples are a symbol love, youth, beauty and happiness. So if you were told to perform a difficult task granted the chance to extend the life of the deceased, would you do it? 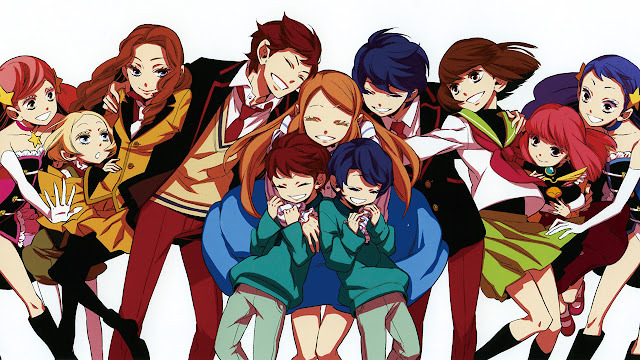 The story of Mawaru Penguindrum follows the story of brothers Kanba and Shouma as they go on that seemingly impossible quest to search for an item called the Penguindrum to maintain the lifespan of their presumed to be deceased sister Himari, who is living in real time. A lightbulb should have went off after reading that last sentence and knowing the symbolism behind penguins and apples. There's not much more to say about the story without spoiling it, but the story is simply that. Although Mawaru Penguindrum was a buzzed about anime, I didn't really bother to watch this anime because I didn't look into it as much. After watching the trailer I was instantly drawn in, not because of the characters but because of the adorable penguins! All the characters play a big role in the storyline. It's unusual that the majority of the cast does play a part in the storyline; if you subtract any of the characters out the anime would lose a portion it's meaning. Now since this is a psychological anime, we see a whole spectrum of characters from the comical penguins to cray cray Ringo. And yes with an anime that's executed like this, the character development was definitive and done properly for main characters like Kanba and Shouma which also extends to supporting characters like Masako and Momoka. The art and sound was done nicely as well. The art is as vibrant as the penguins were. Whereas the sound is a staple which can be enjoyed by everyone. The opening and ending were decent but the highlight of the sound was the OST. I cannot stress how amazing the OST is, it's one of the best out there and probably up there with my favourites like Aria. One of my favourites from the OST is titled, The Children of the Fruit and Destiny. There are going to be two types of people who watch this anime. The people who watch it out of pure enjoyment and the people who are going to pick up recurring themes throughout the story. Those who watched it out of pure enjoyment will have no difficulties getting through the anime. But for those who do pick up the symbolism, following the storyline might become difficult and the symbols might cloud the meaning at times. I was one of those who did pick up the symbolism and had to read the synopsis of the episode before watching the next. Doing that didn't kill my enjoyment of the anime, it actually did the reverse by making me appreciate the anime more. Either way people are going to have a pleasant time watching. There's not much left to say. I watched this two years ago and I still think about this anime from time to time. If you're looking for something riveting doubling up as a piece of literature, I encourage you to watch Mawaru Penguindrum as it became one of my favourites. Thanks for reading, if you have any feedback please feel free to drop a comment.